Kettle Art presents: "For the Love of Kettle"
"For the Love of Kettle" is the one night only, annual fundraiser that helps to keep our little gallery afloat. Thanks to Dallas' amazing artistic community, we are very excited to be approaching Kettle's 10th year of great art and great people. Please join us on this special evening as we kick off a year of innovative exhibits and special events. This exhibit will include emerging and mid-career artists we have represented over the years, plus many artists new to Kettle. All works are priced at $50.00 each; however, in honor of the unfailing support of Deep Ellum 42, the first 42 pieces will be sold at $42. So, come early and stay to mingle! Up next: in response to the artists' generosity, all those in this show are invited to participate in our next exhibit 'For the Love of Artists', opening the following Saturday, February 15. During its two week run, the gallery commission will be waived. 100% of all sales will go directly to the artists. Kettle Art has been the recipient of numerous awards and designations including USA Today's 10 Best Art Galleries in Dallas, Dallas Observer's Readers' Choice for Best Art Gallery, and Dallas A-List's Best Art Gallery. National publication mentions include: Art News, Juxtapose, Southern Living, USA Today, and most recently, ArtPlace America." New Assemblage Piece, 2014 - "From The Beginning"
Materials used: crushed raw amethyst quartz crystals, chrysopase stones, lepidolite stones, smoky quartz crystals, raw girasol opal stones, pyrite, lotus pod, sea shells, dried wasp nest, found/collected metal, glass, paper, wood, copper, plastic objects, fresh water pearls, feathers, acrylic and enamel paint. ALM7 - Opening Reception, February 02, 2014 at Janette Kennedy Gallery in Dallas, TX. Reception open from 7p-11p, all are welcome, free admission. February 2014 marks exactly SEVEN years since ArtLoveMagic was founded. We have the unique privilege of curating the same gallery we began in, The Janette Kennedy Gallery in South Side on Lamar, for the entire month of February, to celebrate and reflect. ArtLoveMagic: SEVEN will include the work of more than 100 artists who have participated with artlovemagic over the last seven years. It will be a show of artwork, memories, and friendships. Tuesday February 4th is the opening reception for that exhibit. Come out and meet the artists, and be among the first to view the exhibit. I will be exhibiting a new Assemblage work in this exhibit, titled "From The Beginning"
With a turnout of several thousand people and raising approx. 45,000.00 for a local charity, this year was another huge success for ArtCon! My piece being auctioned from Art Con 8 in 2012. Let the Press Begin! Light up Dallas, show your Aurora! AURORA 2013 - Convergence of Light - October 18, 2013. Art Conspiracy presents MOUNTED on Saturday, June 8. Event to unite artists, raise “seed” money, and conspire for a good cause and a good time. 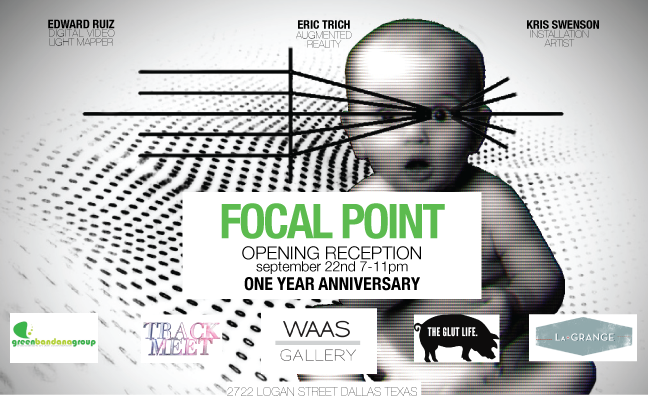 May 9th, 2013 – DALLAS – Conjuring visions animal, vegetable, mineral and digital, Life in Deep Ellum will be transformed from a gallery space into a lodge-like, electronic animalistic mounted dream sequence that only those crazy Art Conspirators can produce. On Saturday, June 8, Art Conspiracy presents MOUNTED will kick off at 7:00pm at Life in Deep Ellum, 2803 Taylor Street, Dallas, Texas, 75226. Original, curated works from over 40 inspired artists will be auctioned live in a fun, free-for-all format. 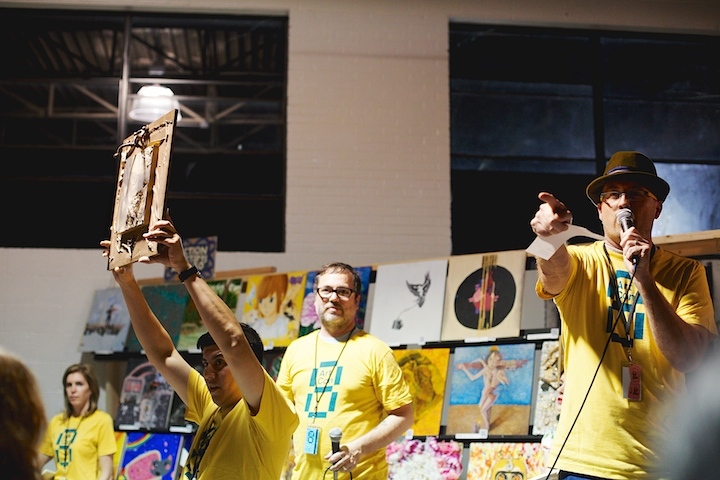 Art Conspiracy events are designed to be affordable and offer everyone a chance to purchase original artwork with opening bids starting at $50. MOUNTED is not just an auction of taxidermic expression, the evening will also feature Mark from The Edge as emcee, and the mood will be set by local bands: The Days, Bethan and headliner Calhoun. Their collective descriptions range from sounds reminiscent of The Jackson 5 or Dr. Teeth and The Electric Mayhem to minimalistic, melodrama, catchy, irresistible, gorgeous and melodic vibrations. Dallas food truck favorites Nammi and Coolhaus will be serving up Vietnamese fusion cuisine,cookies and ice cream in the parking lot. Black Swan Saloon will be pouring libations and a signature MOUNTED concoction, and MoKaH Coffee Shop will be open for those in need of a caffeine buzz. The mission of Art Conspiracy is to inspire Dallas’ art and music scenes to join forces for the benefit of local non-profit arts organizations. Non-profits with an annual budget of less than $400,000 and that offer creative programming in the form of art or music that gives back to youth, families, and citizens within the Dallas city limits are considered to be chosen as Art Conspiracy’s annual beneficiaries. W. T. White Academy of Visual and Performing Arts – Ceramics Program, dedicated to helping students succeed, regardless of socioeconomic status, physical, mental, or language limitations, or lack of previous education. Art Conspiracy organizers, musicians, and artists are available for interviews. Additional press imagery and graphics are available upon request. For more information, please contact Meagan Dahl at meagan@artconspiracy.org or call 214-864-8730. Art Conspiracy, a Dallas-based art collective that raises money for small non-profit groups that provide art and music programming locally, presents MOUNTED auction and fundraiser on Saturday, June 8, 7pm – 12am. Art Conspiracy is street level philanthropy. Members of the creative community in North Texas pool their talents to create bi-annual fundraising events that support other nonprofit arts programs. Art Conspiracy events are designed to be affordable and offer everyone a chance to purchase original artwork at a reasonable level. Art Conspiracy is a 501c3 organization with IRS non-profit status (so your donations are tax deductible!) More information is available at Facebook, Twitter or artconspiracy.org. April 2013 - Recipient of The University of Texas at Arlington's 'Creative Faculty and Staff' Award. Awarded for 7 notable art exhibits in 2012. (Award & Publication.). Arlington, TX. The Arts United Magazine Issue #3: Metaphysical Expressions: (Opening Reception Date TBA) San Antonio, TX. Metaphysical: of or relating to the transcendent or to a reality beyond what is perceptible to the senses. Art gives us the ability to share our unique connection to the universe. Oftentimes, the most powerful connections that we make with the metaphysical world are at first formless and intangible. Whether they are visions, floods of sound, or words echoing in the mind, it becomes the artists' mission to create physical representations of those experiences, making the artist a liaison between the community and a realm beyond perceptible senses. But, where do these experience come from and why have they chosen you? We want this issue to contain art that is related to the process of receiving, filtering, and giving physical form to creative energies. We want this issue to find their source and discuss belief systems that give meaning to our existence. We want this issue to propose new truths, to reinstate old truths, and to shout out questions that topple dogmas. Our goal is to welcome the diversity of thought and give each artist the power to help define our current society as well as construct a future one. Over 30 local FWD artists showing and selling their craft. Artwork will remain on display for the next 30 days after the opening. Enjoy hanging with friends and family while indulging in art, music, food and drinks. Some of the artists will even be working live, so be sure to check out their skills! We will also have huge artist panels available for those young and old itching to paint something during the event. We will of course have our raffles/door prizes through out the night - must be present to win! Music will be hosted by DJ TRAIN, DJ WHOLE FN SHOW for the first couple hours and starting around 9pm: TIDALS. Our good friends at Martin House Brewery will be sponsoring the event with some of their new brews! This is a family friendly event, bring the entire family out! Kris featured as guest vocalist on band Herd of Instinct's debut cd, self titled. Cd reviewed in October 2011's Guitar Player Magazine as 1 of the Editor's Top 3 new bands! Also features cd art design and layout by Kris (conceptualized and commissioned by Mark Cook). Hear the song "Blood Sky" released on FirePool Records, 2011. “Blood Sky”, the only track [from Herd Of Instinct] featuring vocals, is one of the undisputed highlights of the album, a haunting showcase for the husky, understated vocals of former 99 Names of God singer Kris Swenson." - Progmisstress. "Although the mainstay of this album is fundamentally instrumental we do see "Blood Sky" featuring some rather stunning melancholic vocals courtesy of Kris Swenson, which are more than just incidental." - Sea of Tranquility. "“Blood Sky” starts with a nice rhythmic tapping guitar theme. It is the only track with a pop-rocky edge by adding a vocalist here (Kris Swenson), who also used to be in the original 99 names of god band. With additional electric guitar arrangements and mellotron this is an attractive mixture of progressive music with modern pop." - Psychemusic. 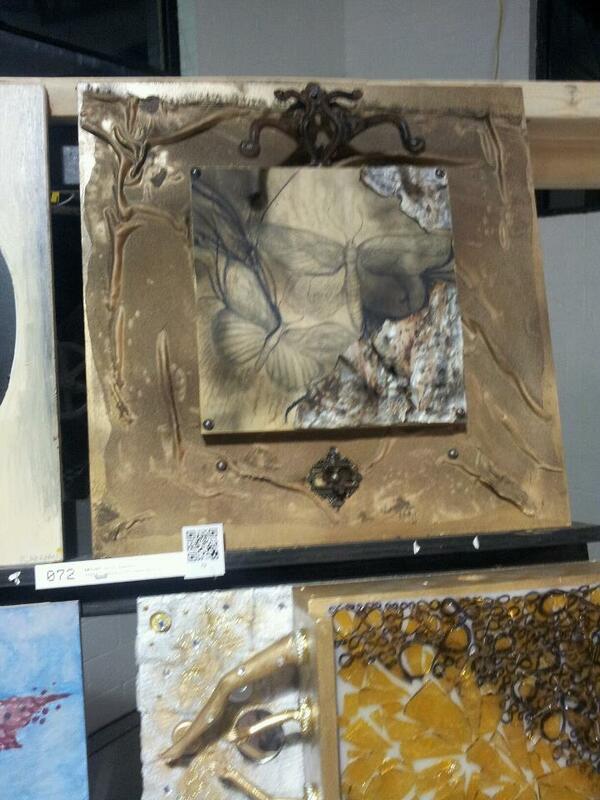 Pieces created live in the Goodyear Tire Warehouse one week prior to the event. Over 150 artists' work auctioned in one nite of music/art/bliss. Beneficiaries include Girls Rock Dallas and W. T. White Academy of Visual and Performing Arts - Ceramics Program. My contribution - "Beauty of Imperfection"
This piece was created on a 16"x16" panel. Assemblage/Mixed Media, 2012. I will be debuting a new film entitled "dreamsequence_02:OriginOfTheIridiumNebula"
From Sept 20 - October 31 I will have 3 new pieces for sale in the Jannette Kennedy Gallery in Dallas, TX, at South Side on Lamar as part of this event. Film viewing will be available during gallery hours. During the opening, all participating artists will be creating live art from 8p-12a, so come out and watch us work and enjoy the nite !!! xxoo!